Score some amazing Xbox One deals at the Microsoft Store and get some extra bonuses to boot until April 22. 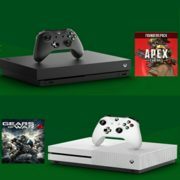 Save $65.00 on the Xbox One X White Special Edition bundle. Bonus codes for Apex Legends Founders Pack and Gears of War 4 are available for all Xbox One console purchases (terms and conditions apply). Check out our other deal on Xbox Live, as well. You can get it for $1.00 and will receive $1000 Apex Legends coins for free. Offers are live until April 22. Shipping is free. Stock is limited so shop now while supplies last.